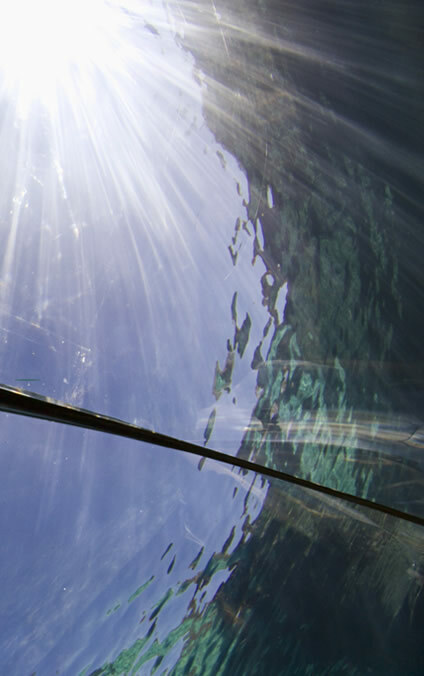 Fish World View - Erick Anderson caught the sky as a fish sees it from a tunnel at the sea lion sound at St. Louis Zoo. Our sky is wide, a seeming huge flattened dome stretching out to infinity at its horizon extremities. Not so a fish’s, or a sea lion’s or an underwater swimmer’s. Their sky is a narrower wave ragged circle overhead on the water’s surface. Light rays are refracted when they enter water to make a steeper angle to the surface. Rays entering the water after almost skimming parallel to its surface are refracted most and they descend at an angle of 49° to the vertical. The whole sky is compressed into a 98° wide circle. The compression is not regular. If the water was ever still a fish would see objects near to the sky horizon somewhat squashed. Sunlight penetrating deep is refracted and sculpted into caustic sheets. Where they intersect sea lions we see the familiar sharply focussed bright lines playing on their bodies. Waves make the 98° sky circle irregular. Outside the circle there are sometimes shifting closed rings of light and colour. These are a watery counterpart of skypools. The wavy surface produces multiple images of the seabed and surroundings to form the rings. Outside the sky circle the fish sees a reflection of the sea bed and objects in the water. The surface totally internally reflects upward going rays within the water making an angle of more than 49° to the vertical. Unlike metallic or other mirrors, total internal reflection is 100% complete - it is used to effect in binocular prisms and other optics.